Following the Bootmaker Trail From Guthrie, Oklahoma, to Phoenix, Arizona. Tourists go on whiskey tours in Scotland, bootmaker Lee Miller tells me, so why not take a custom bootmaker tour in America? Could get a little pricey, I think. A $50 bottle of Scotch is one thing, but a $4,000 pair of boots is not out of the realm of possibilities. Yet, I like the idea. J.B. Stetson made his hats back East, but custom boots are Western, have been since cowtown bootmakers put their souls into their soles. These boots are made for driving, so I’m taking the Bootmaker Trail. Need proof that boots are art? Look no farther than Lisa Sorrell’s Sorrell Custom Boots in historic Guthrie. She won the Best Artist Award for wearable art at last year’s Southwestern Design Conference. Not bad for a former seamstress who “wasn’t raised cowboy” and had “never worn boots” until she answered a newspaper ad and started stitching tops for legendary bootmaker Jay Griffith. Over in Pawnee, Jerry Brown was raised cowboy. At Hole in the Wall Boots and Saddles, he’s putting his own brand on Pawnee Bill’s town. Cowboying for a living made Brown appreciate good boots. “I got really tired of shelf boots that would wear out 60 days after you bought them,” he says. Sorrell and Brown are relative newcomers to the trade, but Blucher Boot Co. in Beggs is part of Old West history. In 2001, James “Smitty” Smith and partner Patrick Hale took over the company Gus Blucher founded back in 1915. Blucher’s clients included Westerners from Emmett Dalton to Tom Mix. It’s time to cross the Red River, home of scores of custom bootmakers. I can’t visit them all, except the ones I find to be impressive. Talk about location. 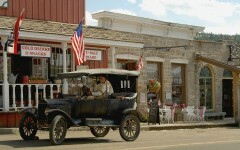 The Carl Chappell Boot Shop sits along the Chisholm Trail in St. Jo. Chappell learned the trade from his father. “He said he over-trained me,” quips Chappell, who now offers bootmaking seminars. Next, I head to the last place you’d expect to find a bootmaker—Saks Fifth Avenue in Dallas’ Galleria mall. But Rodney Ammons (Affinity Luxury Shops/Ammons Boots) has always done things differently (just ask colleagues about his notorious fart machine). “It’s a passion,” Ammons says, in reference to bootmaking, not playing jokes with a fart machine (I think…). Boots are manufactured at the El Paso plant, but custom orders are taken at the Saks shop. Ammons once made a pair for the Rev. Billy Graham’s bodyguard, with cross inlays and a hidden derringer holster. 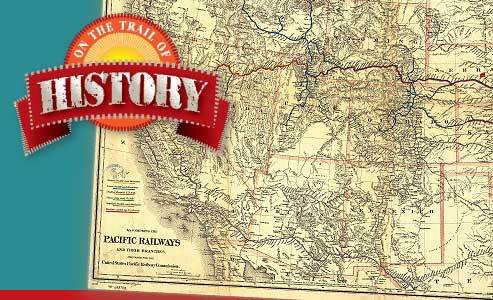 From Big D, the trail leads to the country. Eddie and Kathy Kimmel of Kimmel Boot Co. near Comanche say they may have the only boot shop in the sticks. The reason is that Kimmel is known for making tough, durable yet beautiful, well-fitting boots. They’re worth the drive. 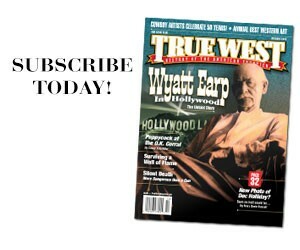 So is the trip to Austin, home of Sixth Street, Austin City Limits and another music icon, Texas Traditions. Lee Miller is working on a pair for Lyle Lovett when I arrive. Not only that, Miller trained under Charlie Dunn, the bootmaker immortalized in a Jerry Jeff Walker song; he took over when Dunn retired in 1986. Things have come full circle. Decades ago, Dunn took this wanna-be bootmaker from Vermont under his wing. Now Miller is teaching two apprentices in his shop, Virgile Mourtant and Julia Parmentor. “This is a true folk craft,” Miller says. In San Antonio, you’ll find another bootmaking institution, Little’s Boot Co., which Dave Little’s grandfather started as a shoe repair business in 1915. “How we stayed in business this long is un-believable,” Little says. Not really. Over the years, Little has earned a reputation for making the best-looking, best-fitting boots around, and you won’t find a fancier shop. Austin and San Antonio are awesome, but you can’t beat San Angelo’s Western experience. Visitors can tour historic Fort Concho, visit an excellent brothel (Miss Hattie’s is a museum these days) and have plenty to choose from in the boot departments. First stop, Brest Boots & Saddle Shop. I love those old machines, the smell of leather. This place looks like a boot shop. 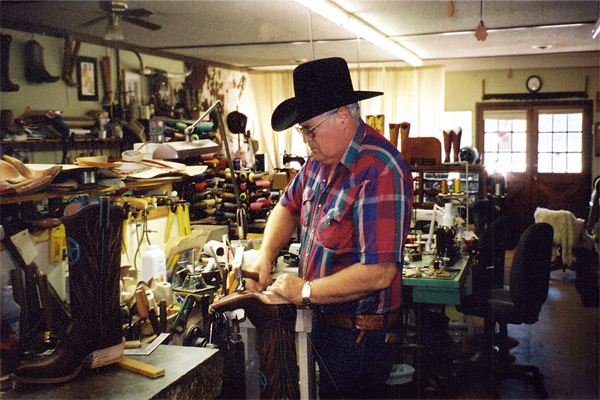 Bootmaking is also an art at San Angelo’s legendary M.L. Leddy’s Boots & Saddlery. M.L. 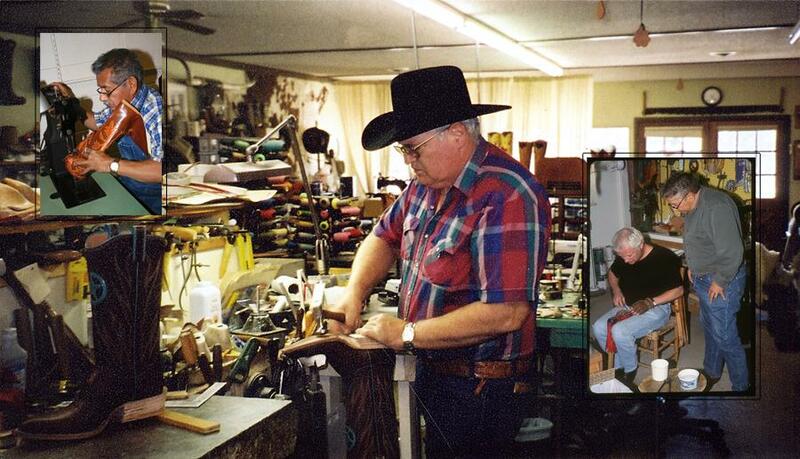 Leddy opened a saddle shop in Brady in 1922, then moved to San Angelo 14 years later. Texas doesn’t have a monopoly on bootmaking. I discover a pair of gems—one-man and one-woman shops—in New Mexico, where I make an amazing discovery: The Kimmels are wrong. They aren’t the only bootmakers based in the boonies. You have to know where you’re going to find Bishop’s Handmade Boots near Tucumcari. I wouldn’t do chores in any boots from south Albuquerque’s McGuffin Custom Boots. Talk about art. Third-generation bootmaker Deana McGuffin learned the trade from her father, and she also offers bootmaking courses. Maybe the biggest compliment comes from other female bootmakers. Lisa Sorrell and Stephanie Ferguson credit Deana for inspiring them to pursue their own bootmaking dreams. It’s on to Arizona, home of three bootmaking aces and a new store that carries beautiful historical boots. I’m not sure what to expect at Stewart Custom Boot Co. in South Tucson. I sure don’t expect to find a ponytailed, revolver-packing former engineer and barbershop quartet enthusiast. Meet Victor J. Borg. Aldolfo Romero and Ronnie Stewart teamed up in the 1940s in Leon, Mexico, before parting ways in 1955. Stewart took his company to Tucson but went bankrupt. In 1970, Borg wound up with the business. 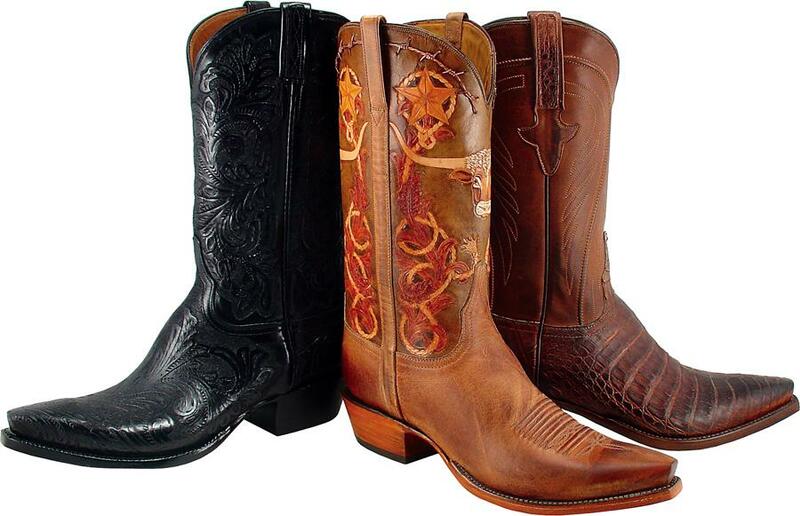 From Tucson, it’s an easy drive to Nogales and Paul Bond Boot Co., a must stop on any bootmaker trail. He has created boots for actors and singers, but Bond is also known for giving working cowboys a durable product. “I just love to see ’em wear our boots,” he says. On my way to Phoenix, I head to Glendale, home to the newest Boot Barn store, which carries the Oak Tree Farms line. Not many women probably realize they can purchase custom boots here. If you’ve got a pair of chaps looking for a pair of boots, this may be your best bet. For those ladies who have been searching for Cathedral, Steeple, Chapel boots and the like, you’ve hit the jackpot. The trail ends in Phoenix at David Espinoza Bootmaker. Which is a theme I’ve heard at every shop I’ve visited. On this trail, I’ve met a lot of artists. Carl Chappell finishes another pair of handmade boots at his shop in St. Jo, Texas; Deana McGuffin, based in Albuquerque, New Mexico, teaches the bootmaking trade to her student, Mark Suess; Juan Ortiz stitches a pattern on a custom boot at Little’s Boots in San Antonio. Sam Lucchese started his boot enterprise in 1883, and the company still makes quality cowboy boots today. Lucchese boots are known for the twisted cone boot last design—the only one of its kind today. 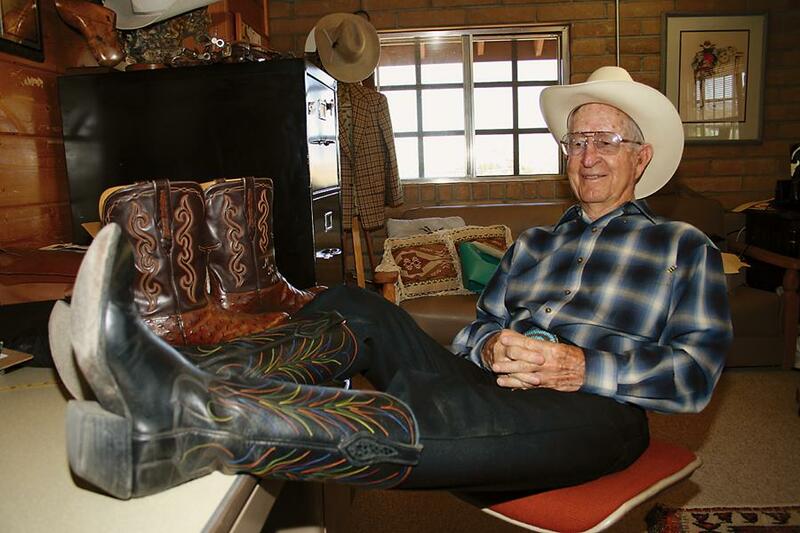 National Cowboy Hall of Fame inductee Paul Bond will turn 91 in December, and has been in the bootmaking business since 1946. He’s outfitted everyone from working cowboys to actors. 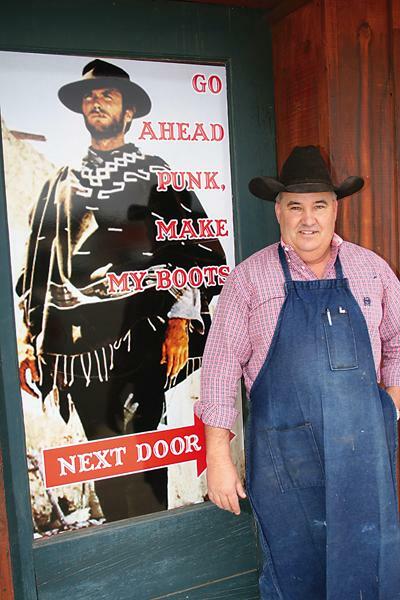 Robert Brest, standing in front of his store in San Angelo, Texas, is one of a few bootmakers who is preserving the art of handmade Western boots. 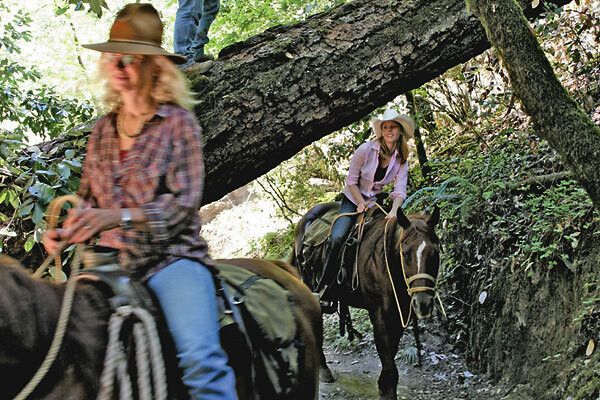 The Russian River’s Redwoods Trail riding in a California preserve saved by a Civil War colonel.